The Bruins got out of Thursday night’s Game Four without much help from David Krejci. He had just one shot on goal in the game, and his linemates only had four. That’s a problem. Krejci’s brilliant playmaking could elevate the Bruins in this series, but if he continues to flounder, then Boston could end up losing in six or seven games in a post-season they really need to capitalize on, with their talent being as strong as ever. 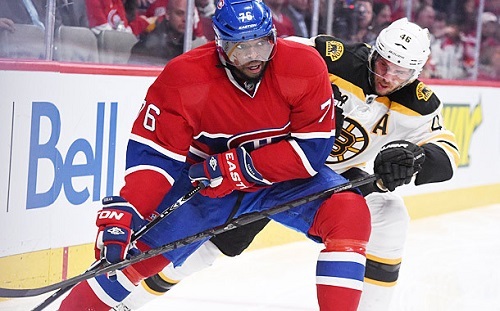 The Bruins can’t afford to let the Canadiens neutralize the center like they have. If P.K. Subban is an evil super villain, then Krejci is the super hero that’s momentarily down and out. After four games of the Stanley Cup quarterfinal between the two teams, the people Krejci protects are under fire. They’re safe for now thanks to his allies, who have kept the series tied and are hanging on- for now. Just a flip of his switch from “off” to “on”, though, would be enough to send the bad guys packing. The allies are Patrice Bergeron, Reilly Smith and Brad Marchand. Save Marchand’s lack of impact in this series thus far, the Bergeron line has pulled its weight through the first four games against Montreal. Bergeron and Smith both scored in last Saturday’s afternoon’s 5-3 comeback win, and in addition to applying good pressure on Carey Price and the Montreal defense, Bergeron’s stick tipped in the first Bruins goal in Tuesday night’s 4-2 loss. The three forwards have combined for 18 points so far this post-season. Boston wields two daggers, though, and if the blade named “KIL” for Krejci, Iginla and Lucic isn’t sharpened before Saturday night, the Bruins might not have enough fire power to stop Subban, the great sword Montreal’s been swinging since Game One- at least not in time to prevent a Game Seven. With his sixth point in the series, Tuesday night in Game Three, Subban demonstrated that he’s the most valuable skater in the post-season for more reasons than just his talent. With roughly five minutes left in the first period of Tuesday night’s game, he burst out of the penalty box, received a pass from Lars Eller in the neutral zone and entered the Bruins end all alone. He gave Tuukka Rask two quick jukes to break the goalie’s ankles, and then he buried the shot. It was his second point of the night, his fifth multi-point game of the playoffs. In front of 21,273 frenzied Habs fans, Subban reminded the Bruins that he’s not only the most versatile weapon on the Canadiens roster but the most clutch as well. He’s not intimidated by the buzz of a packed Bell Centre. He thrives on it. Even when matched against the likes of Sidney Crosby or Alex Ovechkin, the Bruins have yet to face a player in recent playoff history who can single-handedly control a game like Subban has done this series. With a guy like that wearing Bleu Blanc Rouge, the Bruins desperately need Krejci to find his game and catch up with Bergeron’s pace. Here are some comforting reminders for Bruins fans- In 2011, Krejci led the league with 23 post-season points. Then, in 2013, he topped that with 26, totaling seven more points than Patrick Kane in his very own Cup run. Can Krejci play on a big stage? The answer, we know, is yes. Another good thing to note is that the Bruins kept Subban at bay by staying out of the penalty box. Just one penalty on Matt Bartkowski in the second period led to only two shots on goal by Subban and absolutely none by Thomas Vanek. That’s a stat to take note of. Boston is finally figuring out how to play a more passive game with the Habs and not let them get too under their skin. Krejci’s linemates aren’t playing poorly, but they’ve definitely had some bad bounces, keeping them off the scoreboard, one of their four points being Lucic’s empty net goal in Game Two. Before he tapped that in at the end of Saturday’s game, Lucic was having a rough afternoon, first knocking a puck over Price’s shoulder with his glove for a deflating non-goal, and then moments later coming up with a great opportunity in front of the net only to be stopped by a remarkable save. Despite tipping in the second Bruins goal, Iginla beat Price from the right faceoff circle with 11:10 remaining in the second only to ring the puck off of the left post. If Krejci can find a way to connect with his wings, it could boost their stats. Right now, the two arms are lacking a head to guide them. Even in Game Four, where neither of the top lines scored, did the difference show up on the stat sheet. Bergeron, Smith and Marchand totaled ten shots. Krejci took just one, and his linemates Lucic had four. Iginla did not get a single shot on goal. Luckily for the Bruins, Krejci’s invisibility didn’t keep them from getting an overtime goal by Matt Fraser, virtually a no name, to keep them from going down 3-1. The way Subban has played in this series, though, it’s not likely that he’ll stay quiet for much longer. Krejci needs to come alive soon. Otherwise, he’s just making the job more difficult for his teammates. Who cares about over-rated, over-grown gnome, Karl Soupcan.